Cheap party buses in Chicago are hard to come by. This can be a disappointment if you have a strict budget to keep in mind for your next event. If you are planning a Chicago event, you already understand the appeal of hiring transportation. It introduces organization and efficiency for the timeline of a celebration. There's a reason why party buses are one of the first vendors that you're going to want to find when you're getting the details of your wedding together. 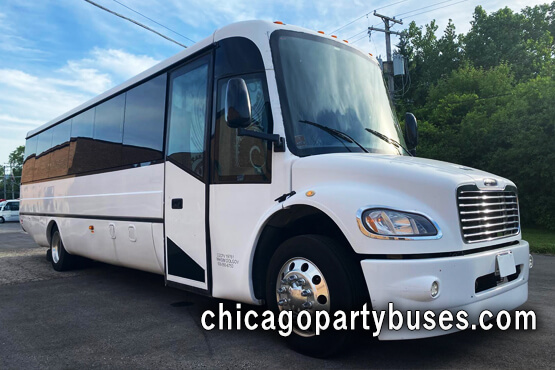 You might be able to find cheap party buses in Chicago, but you want to make sure you're choosing a quality company or you might waste all of the money you spent! It's worth it to do research on affordable options so you're not left in the dust. Have you heard stories of passengers reserving a vehicle that shows up dirty, or not at all? This is something we've actually heard of quite a bit. You'd be surprised at how much it happens! There are a lot of unsavory individuals out there trying to capitalize off of being a middle man between people who own vehicles and those who want to rent them. You can rest easy knowing that we own all of our vehicles and do everything in our power to make sure they reach you in the most affordable fashion. This includes rolling our savings down the hill to you, no special action required from you! We think it's much more important to provide you with a feasible transportation solution when you're looking for cheap party buses in Chicago. There are many reasons why you might want to cut costs! When you're planning something like a wedding, there are already a myriad of other vendors that you're going to have to pay for. The costs can add up quick. Any money that you save now can be put toward your new life together with your sweetheart! Even if you're planning a night out with friends, professional transportation can actually help cut costs instead of add to them. This is especially true if you're used to ordering ride share services through an app on your cell phone. When you use this type of transportation with a group, you often have to order more than one vehicle. This can really add up over time! Party buses have a lot more to look forward to in terms of features when compared to sedans and SUVs. You can't get up and move around in an Uber or Lyft! Our vehicles are made specifically with your comfort and convenience in mind. You can truly enjoy the period of time in between your destinations rather than using it as a method of travel. We implement our cost saving measures all year long, so you can always be confident that you're getting the best price when you're in touch with one of our customer service representatives. If you need any more information on how we're able to elevate your next event without raising the cost across the board, we look forward to talking to you!